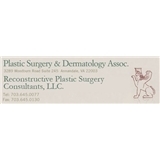 Plastic Surgery and Dermatology Associates (Fairfax) - Book Appointment Online! Our mission in our practice is to provide our patients with genuine care, professional medical treatment, and the respect they deserve. Disclaimer: If for any reason you are unable to make your appointment, please keep in mind that our office has a 48 hour cancellation policy. Please be sure to cancel/reschedule your appointment within 48 hours to avoid a cancellation fee. Couldn't have been more pleasant. She's what docs should be -- knowledgeable, talented, compassionate, friendly, funny.